Christchurch is a picturesque medieval town located between the Rivers Stour and Avon. 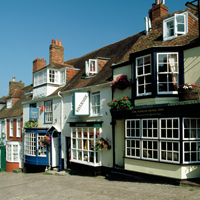 The town is uniquely located, bordering the beautiful New Forest National Park to the North East and the fashionable seaside resorts of Bournemouth and Poole to the West. This beautiful town boasts a stunning harbour, castles, an ancient Priory Church and an excellent selection of shops, restaurants and cafes. Little wonder the town is becoming so popular with people wishing to relocate to a more relaxing and carefree environment. Beaulieu gardens Home Park is located just 11/2 miles outside of the town centre. You can walk into town in 15 minutes or alternatively it is 5 – 10 minutes by car or bus. Buses stop regularly only 5 minutes walk from the park and provide a regular service into Bournemouth, Poole and Lymington as well as Christchurch. A number of Excellent grocery shops, restaurants and pubs are within a ten minute walk of the park with the Tesco superstore being only 5 minutes drive away. For sports enthusiasts and nature lovers Christchurch harbour and the New Forest provide a myriad of opportunities for activity and nature lovers alike. The park is also close to a number of excellent public golf courses, swimming pools and leisure centres.